J'ai un peu laissé ma veste DKNY en denim de coté afin 1) de prendre des vacances et 2) de coudre pour ma petite soeur adorée qui est enceinte. Si elle m'accorde ce plaisir, je mettrai des photos d'elle portant les vêtements bientôt. Hier soir, j'ai pris tu temps pour mes projets et j'ai avancé la veste, voici un avant goût du corps de ce vêtement. Recently, I put aside the DKNY jacket to 1) take vacations and 2) sew for my adorable younger sister who is pregnent. I do not have pictures of those garments yet since they look ridiculous on my mannequin. Little sister has curves I do not have ;-). Last night, I was able to put few pieces together, it gives a good hint on the final result. Bien que le denim soit un peu rigide comme tissus, j'aime l'effet pour le dos. 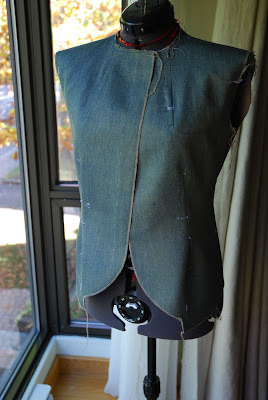 Though denim sometimes lacks fludity, I like the effect on the back of the jacket. Je crois que les surpiqures ne sont pas suffisamment apparentes. Qu'en pensez-vous ? I don't think that the overstiches are not sufficiently obvious. What do you think ? Do not hesitate to leave a note. The topstitching seems to be more "part of the sewing structure" than ornamental. Do you want to "hightlight" your topstitching? Could you use a thicker/other sort of thread? Anne I really like the shape of the jacket. The details are so smart. I think they would look terrific with more obvious topstitching. I am sorry, I do not understand French, and I think Paco has already said this, looking at the numbers! It looks as if you have used a short stitch length and ordinary thread? 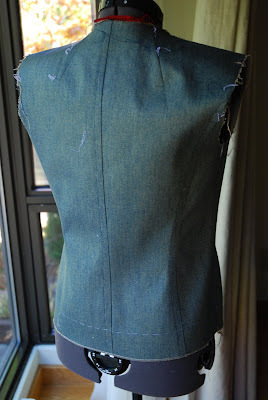 On denim, I prefer a longer stitch length for topstitching. I use a 4mm or 4.5mm stitch length, which gives an effect similar to ready to wear, and also usually use gutterman upholstery thread. However, the jacket is already looking great, and if you want a more subtle look, what you have already done is perfect. Well - with or without R :-) - I was very happy about your comment! Thank you very much. I also browsed through your blog and absolutely loved it! Have a wonderful day and see you soon on the blog! Merci Annette !!! Thank you Annette !! !